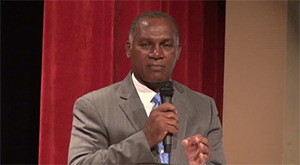 NIA CHARLESTOWN NEVIS (August 26, 2014) — Premier of Nevis and Minister of Education Hon. Vance Amory, impressed on the island’s teachers the importance of adopting the holistic approach to teaching being promoted by the Department of Education in an effort to effect positive change in the society. “I want us to, during the course of this year, seek to have a well-developed understanding of social issues in our children and to have them develop social skill and graces, good manners, know when to talk loudly and when to be quiet and when to speak softly. Those that are skills that can be taught and need to be taught,” he said. The Nevis Education Minister added that apart from the academic prowess the teachers would impart on the students, they would have to go the extra mile the results of which were rewarding. “We need to also get our children to develop interpersonal skills. Qualities of sharing, honesty, things like that which we do not test but are necessary for living… I want us to challenge ourselves as teachers, so that we go the extra mile because… if you go the extra mile, you would be asked to go another extra mile but that is ok, don’t worry about that. “There are some who have done that and have not regretted it and if all of us do it, then none of us will have regrets and so teachers, I am asking you to see our children not as just recipients of knowledge but as a open mind on which you should stamp your influence but also stamp your guidance and teach them and in doing that, I can ask you to develop initiatives and strategies to seek to advance our children to that higher level of which we could feel proud that we, I, have been part of that process,” he said. Notwithstanding, Mr. Amory told the teachers that they should be willing to take up that challenge since in the end, the Nevis community would be the better for it. “How do we address the matter of bringing about positive changes in the attitudes of our children? I want that to become an important part of our teaching and learning opportunity and experience, that we do not just see ourselves as setting work for the children to learn, memorise and even analyse but that we get them to understand, that they are more than just a receiver or analyser of information but that they are human beings and have an important role to play for themselves, in the society in which they live, in the country in which they live and in the world. “As they grow up and travel, migrate or interact with other people, that they will have those positive attitudes and social graces which will make them good citizens of our country and good citizens of the world,” he said. According to Mr. Amory, as leaders in education, social development in the private sector and the business community everyone should contribute to the holistic development of the island’s children. “If we want to have a successful country, we are all in this together and it is not just when the West Indies play cricket we say ‘We all in.’ We all in simply because if we produce good students through our holistic approach to training, setting out those positive outcomes that we would like to achieve, that every single sector will be a winner for the efforts that we make. “Some of those attitudes and attributes would be looking at getting our children to speak well…and to ensure that our children can communicate effectively. We also have to look at how we get them to think critically, to be rational how they think, reasoning, be able to differentiate between waffling and actual communication and also give them a general knowledge of some technical or skill-based subject,” he said. The opening ceremony heralded the start of a week of activities for teachers prior to the official start of the new school year in September. Among the activities listed are workshops for various subject areas, First Aid training, Heads of Department meetings, Early Childhood Education sessions, Counsellor sessions, school visits by the Principal Education Officer, meeting with Physical Education Teachers and meeting with Nursery Practitioners.